What makes a great presentation? Hint, it's not the quality of your slides. 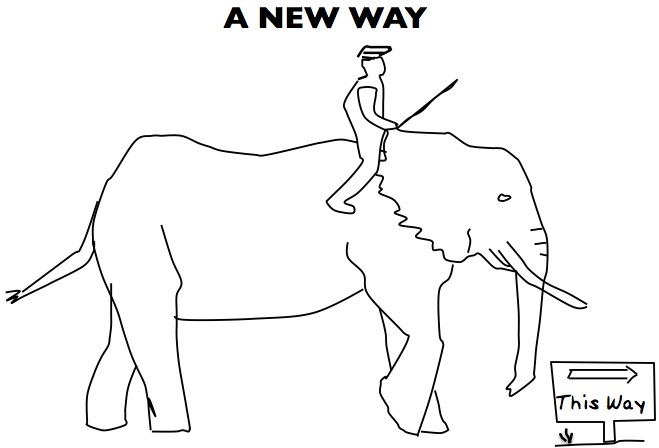 I saw Dan Heath speaking on stage several years ago and he held the audience captive for 20 minutes telling stories using this one image of the elephant and the mahout (rider). He told stories about change and used the elephant as a metaphor for the challenges in creating change. In this situation below, who's in charge, the elephant or the mahout? In one of many metaphors, he discussed the person who wants to lose weight. The conscious mind is the rider, who wants to get healthy and lose the unwanted pounds, but when the elephant (emotional being) decides it wants a snack, who do you think wins? In any change initiative, it helps to provide guidance and direction to help make change happen. The most effective presentations are sales communication events that successfully integrate simple yet memorable images with product value-creation and weave a story around the buyer condition. It's not about glitzy slides or bullets. 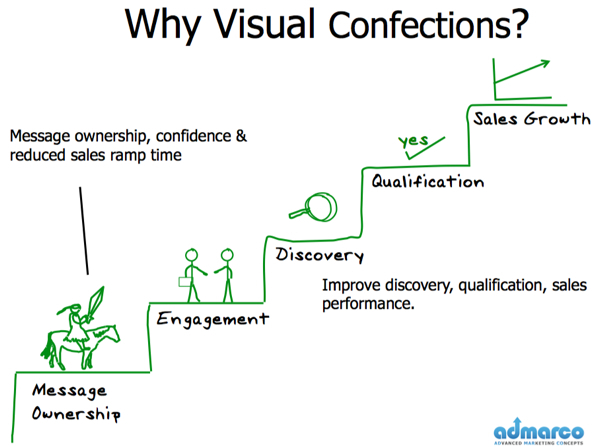 When we use Visual Confections to tell our story vs. PowerPoint bullets, we create simple hand drawn images (that are immediately meaningful in the context of the discussion), interwoven into a story around issues that the buyer is potentially struggling to overcome. The hand-drawn images themselves are meaningful and are stored in our brain and tie in the context of the story, relevant facts and proof-points. Perhaps this is one reason why people remember well constructed whiteboard stories months after experiencing them. The picture on the right tells a compelling story using images and just 7 words. We use a visual storytelling structure within our visual confection stories that loosely follows the Hero's Journey to create contrast between "what is" and and "what could be" and engages the buyer in conversation around the challenges of the now. 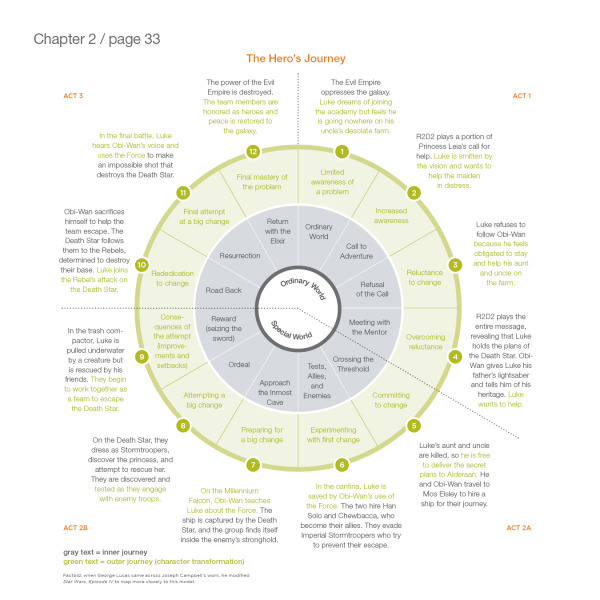 The illustration is from Nancy Duarte's Resonate and her book is highly recommended for a clear explanation and powerful examples of the Hero's Journey structure....and perhaps a moment of enlightenment when you realize that you have seen this structure countless times as it is used in nearly all great books and movies involving personal triumph. These challenges of the now and the buyer condition can be easily illustrated in a visual confection and the effective salesperson will engage the buyer in discourse on "what-is" prior to presenting an opportunity to change their approach and adopt your solutions or product/service to produce a favorable result and future value. In a Visual Storytelling workshop, everyone on the customer-facing team learns to tell the story and draw the whiteboard. With practice, any salesperson can drastically change the ratio of presentations leading to a sale using the above structure and well developed presentation.